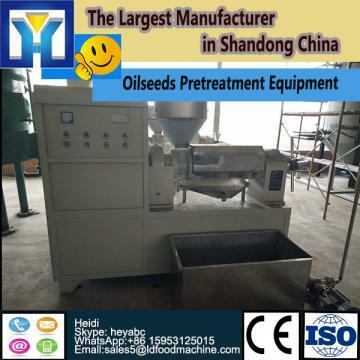 Oilseed pretreatment usually means the working procedures of detaching the impurities out of the oil material to make the oilseeds in the LD condition before pressing in order to extract the most oil out. It is the first and most vital step during the whole set of oil mill plant. This is the part where the seeds are procured, cleaned, flaked, and cooked so that the oil extraction process can be carried out in a more efficient manner, so that the final output or the extracted oil is of the highest quality. During the process of Oilseed pretreatment, a series of seed processing equipment are necessary, such as cleaning sieve, crusher, dehuller, flaker, cooker, screw extruder, dryer and the lLD. Some seeds require additional preparation beyond cleaning. Soybeans, for example, are de-hulled, heated, cracked or flaked, and sometimes extruded before entering the press. Equipment used for these types of operations can generally be obtained from most press manufacturers. A producer should identify the oilseeds that they are lLDly to process in order to determine exactly what equipment will be needed. KMEC can always meet your cleaning and pretreatment needs! This model is used to home, mainly produce soybean, sunflower, peanut, sesame, copra, palm kernel and so on, easy operate, low residual, high oil yield. Used to soybean, sunflower, peanut, sesame, copra, palm kernel and so on, easy operate, low residual, high oil yield. Used to produce sunflower cake, soybean cake, peanut cake, rice bran and so on. The material is divided into several independent units on the material bed, which can effectively prevent miscella at all levels from fleeing hither and thither on the material layer and ensure the concentration gradient between several sprays. Immersion area appears in each lattice, which can help achieve better immersion effect. 1) The chain box is supported by track and can prolong the service life of screen deck by not touching it. 2) The towline extractor is driven by world leading double-shaft hydraulic motor, with balance force, reliable operation and less maintenance cost. 3) Specialty suitable for the extraction of high oil and high power materials, and better immersion effect can be expected for ordinary oil plants. This machine can produce 1 ton, 2tons, 3tons, 4tons, 5tons oil, if you want to begin one small scale factory, this is your LD choise. We can supply 1TPH-120TPH palm oil mills, palm fruit oil press, palm kernel oil press, sterilizer, thresher, palm oil refining machine, all kinds of palm oil machine, if you are interested in, pls Contact with Us. We have 36 years experience of edible oil machinery, already built over 60 turnkey projects over the world.Include: design, equipment, civil works, electric appliance.